This is a nice climb once you get up near the pass. It is not very long, but the last 5 km are somewhat steep at an average of 7.8%. It is another one-sided pass. You start either by Pont de Fégire (772m) if coming up from Montreux or at Châtel-St-Denis (809m) if coming from elsewhere. As I did it, you could possibly, but not likely start the climb in Les Paccots (1067m) if coming down from Col des Joncs (1199m). You could also possibly start the climb in Les Rosalys (1120m) if coming down from Col de Rathvel/Ratvel (1233m) or from Col de Villard (1459m). From Les Rosalys it soon becomes steep (think I found water here). 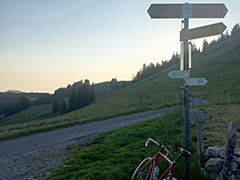 After a restaurant (Saletta) you reach the high point of the road (1525m) and then you have a great view down over a first pass – Le Creux (1496m) and the mountains beyond. After a small up and down you soon reach the pass, after which the asphalt road continues down to yet another restaurant (Le Vuipay) where it ends. Other comments Great views in the top section. Two restaurants, but no place to sleep up here. If you do not wish to walk over to Col de Villard (and cycle a part of it) as I did, you will have to go back down again.